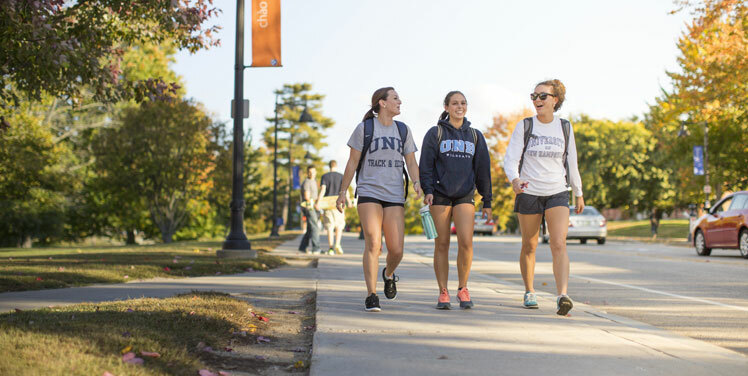 While at UNH, you should not miss out on all of the great places that are not too far away. UNH is only an hour and forty-five minutes south of the White Mountains. Covering around a fourth of the state and being home to Mount Washington, the highest peak in the Northeastern US, this mountain range is too breathtaking for one to miss out on. On the opposite side of the spectrum, UNH is only an hour north of Boston, MA for those seeking a more urban adventure. Even closer to the campus of UNH, there are many places to go to as well. On campus aside from what Main Street has to offer, we have the Dairy Bar to satisfy your sweet or savory cravings. For the late night greasy/fried cravings; Kurt’s Lunchbox is a no-brainer, (if you haven’t been there you are surely missing out on the heart-or should I say stomach-of C-Lot on weekend nights.) If you’re interested in branching out a little farther, the towns of Portsmouth and Newmarket have tons of shops, boutiques, and places to eat that are definitely worth going to! For all you coffee aficionados, The Coffee Station in Newmarket is one of my favorite spots. Paws & Relax is a pet therapy program offered at UNH. Hamilton is a Great Dane mix who is scheduled weekly to visit the libraries around campus and other academic buildings, for the sole purpose of brightening your day! Hamilton can be requested to visit a residence hall, Greek house, and classroom or student organization. He is even available for one-on-one therapy sessions in health services! If you are in need to de-stress, or just missing your pooch back home, Hamilton is definitely a lovable guy who is worth paying a visit too! Located in Hewitt Hall, this University-run clinic “provides family-centered diagnostic evaluation and consultation to assist families of children who have developmental challenges”. In other words, families from around New Hampshire can come to UNH to have their child evaluated medically, developmentally, and educationally by UNH staff specializing in health fields. Students studying in corresponding fields have the opportunity to shadow and observe these evaluations. While this may not apply to everyone on campus, for those who are able to, a wonderfully eye-opening and insightful experience towards their future careers is provided. While many people just know the MUB as holding a few lounges and Union Court, the MUB has much more to offer. The MUB has many leisure activities such as MUB Movies at the two theaters located on the Third floor, the MUB Game Room where students can play pool, ping pong, and video games, and many events and lectures revolving around various topics that are all available on their schedule, and more! These are just a few of the many wonderful opportunities provided to us Wildcats here at UNH! With most students only being here for four short years, there are definitely some experiences that you won’t want to miss out on here in Wildcat Country!